You Know That Moment When? You finally have approximately 7 minutes to yourself and you’ve got wax on your upper lip and you’re trying to psyche yourself up to rip it off but the doorbell rings and you think “surely, surely someone else in this house will be answering the door” because you certainly can’t without scaring the ba-doodle out of whoever’s actually at the door and/or whoever is answering the door? Only, no one does? Yeah, that. 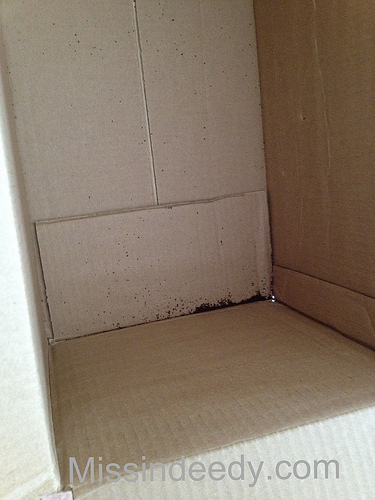 Or, you finally get the box from Major Online Retailer containing your precious liquid gold coffee pods that you’ve been desperate for and you carry it all the way through the house to the kitchen only to open it up and take the smashed-up box of coffee pods out to find this at the bottom? And now you see that you’ve left a lovely dark TNT-like trail of coffee grounds from the front of the house to the back? Why is there so little in the box, you ask? That’s because the other 80% of the pods are now strewn throughout the house. And then, of course, there’s that moment when you ask youngest sweet child if she’s all done going #2 and she says “NOT YET MAMA!” and you think, “Alrighty then, maybe I have 1.4 minutes to jet the folded laundry upstairs so that at least it’s somewhere in the vicinity of the bedrooms instead of on top of the dryer like it has been for the last week day or two.”, but as you are coming back down the stairs, sweet child looks at you expecting a compliment because, “I am ALL DONE wiping, Mama!”, only, she oh-so-clearly isn’t? So, you give up for a quick moment and have a sit-down to check your email and find that the rush-order you placed for things you need for your trip on Thursday morning have been delayed and might be there by… Thursday instead of Wednesday, as planned? Yup. On the bright side, (or, terrifyingly), the day is only half done. So there’s that. This entry was posted in Trouble Indeed, Yes, Indeedy and tagged Coffee, laundry, Monday, waxing. Bookmark the permalink. Aw girl! Just sounds like one of those days. Have I told you that you are by far my favorite blog to read? You are so talented!! Can’t wait to hear about the conference, then meet-up in Jersey!!!! WOO-HOO! By the way, my friend and I are going to the Women of Faith seminar in Connecticut, I think. Could you go? Come on! HA! As thank you so much Brianne! That means a ton! Let’s talk about WOF!! !